This French audiobook clearly explains complex points of grammar and vocabulary such as the various French pronouns, irregular adjectives, the many ways of asking questions in French and interrogative expressions… The story part, which continues the adventures of Mary and her friends, illustrates what is explained in the study guide so you also learn the grammar in context. You’ll then practice the new concepts with exercises. 9+ Hours of story chapters + study guide + grammar and vocabulary exercises – all professionally recorded by a Parisian native + 182 pages PDF transcript. J’espère que vous pardonnerez les erreurs que je ferai en écrivant ceci. Je n’écris pas souvent en français. Je suis en train d’étudie avec À Moi Paris niveau 3. Je l’aime beaucoup ! J’ai acheté le livre audio surtout d’entraîner mes oreilles de comprendre le français oral ce qui est souvent beaucoup trop rapide pour moi. Petit à petit je pense que je m’améliore. Je voudrais vous raconter une petite histoire…mon mari et moi aimons écouter une chaîne de jazzradio.com appellée Paris Café. Plusieurs fois nous avons entendu une phrase bizarre au milieu d’une chanson particulière. Mon mari (qui ne parle pas le français) disait “Are they saying ‘Yankee Noodle’ ? J’ai toujours dit que j’étais sûr que ce n’était pas ce que la chanteuse disait, mais que je n’ai aucune idée de ce qu’elle a vraiment dit. J’ai aussi entendu “Ya…” dans un film et pendant d’un reportage de France 24. C’est exactement le sorte de choses que j’ai besoin d’apprendre. Mon mari et moi, nous avons eu la bonne chance de voyager en France chacune des 7 dernières années et nous avons prévu un autre voyage en avril. Nous attendons avec impatience notre première visite en Bretagne cette année. Nous avons regardé quelques-uns de vos messages sur YouTube à propos de la Bretagne et nous les aimons beaucoup. Merci pour votre travail de les livres audio et aussi le blog. J’apprends quelque choses chaque jour. I’ve been through Level 1 (quickly), 2 & 3 (in detail). Your books have been a game changer for me. I started studying French as a retirement project 6 years ago, on my own with some help from a retired French teacher from the school where I taught. I had some experience from high school, but not good teaching. I tried again at the French Library (Boston) about 30 years ago and then a several classes at Harvard Extension, but I just couldn’t keep up and teach, so I put it on my retirement list. My weakness is hearing and understanding, and working with your audio books has been just what I needed!! I have no intention of going to France; I just study because I love the language and I like the challenge. It IS a challenge as I am dyslexic and words don’t come easily! I can read and understand pretty well, but the aural understanding has eluded me until I found your books. THANK YOU!!! I’ve been trying to relearn French for some years and have tried out several different audio books and podcasts. French Today is by far the best. This was the first of the À Moi Paris audiobooks that I bought (bundled with À Moi Paris Level 4). I loved it so much that I quickly bought the next bundle and most of Camille’s other audio books. I’ve found them fantastic – Camille explains grammar points really well, the study guides are brilliant and her accent and enunciation is so clear that I’m finding my French accent is getting noticeably better! The stories are fun and engaging and pack in a lot of vocabulary and grammar almost without you noticing. I’d recommend extremely highly!! I have been enjoying Camille & Olivier’s products (A Moi Paris series, Essential Verb drills & French dialogs, as well as their weekly newsletter – it’s the best!) for years now and the only reason I am not as fluent as I would like is due to the limited time I devote to practicing. As Camille always says, ‘Repetition is the Key,’ and if you use any of these extremely thorough, detailed and generous lessons, you will be speaking and understanding French in no time. I mention generous because these lessons are EXTENSIVE and filled with hours and hours of audio and practical information that you will need to know if you truly want to master the language. I have tried many different learning methods, including courses offered here in France, CD’s and online websites, but French Today is by far the most user friendly and realistic approach to learning French I have found. 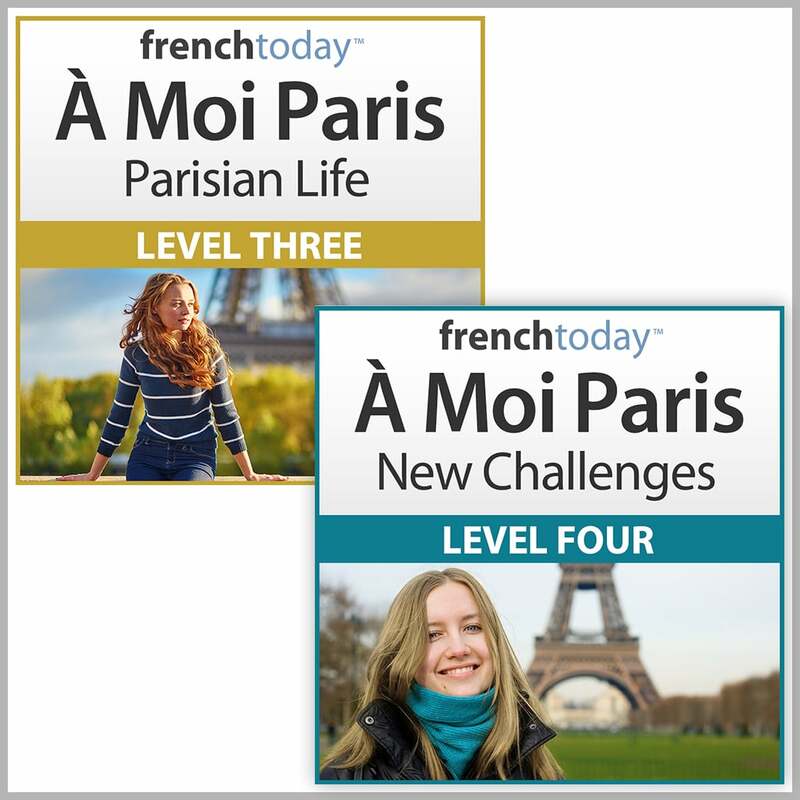 In fact, I recently downloaded two additional Verb Drills and A Moi Paris to help me in the New Year, with high hopes that this is going to be the year when I turn that corner! The descriptions of the product is right on. I am very happy with Level 3 as I’m not quite a beginner anymore. The dialogue is something I could see myself using and the audio recordings help with how speech actually sounds. It has really helped me with understanding movies. One day I will be able to watch without french subtitles and a big part of that will because of French Today! Bonjour à tous ! J’adore mon livre et ce site ! Ses explications sont super et elle parle lentement et je peux comprendre tous! Comme elle dit…la repitition est très important mais aussi….tu dois avoir beaucoup de patience! Hi! I purchased my book and I love it. Her explications are clear and she talks slowly. The website is fantastic too! These books will be a tremendous help to improve your French. i have many online courses and books plus i live in france yet i found the course worth the time and money, very effective. The French Today audio books are definitely helping me to improve my French. There are many reasons why this is so. They slowly build in difficulty so you don’t feel overwhelmed. They are very clear – this helps your pronunciation. The Study Guides provide easy-to-understand grammatical points and a huge amount of vocabulary. I have found by using Camille’s mantra, ‘repetition is the key’, my vocabulary has increased dramatically. You can listen to the audio books anywhere – I bike and drive learning. There are easy to use options such as hiding the English translation, varying the speed of the stories, and pause and fast-forward buttons to make learning easy and effective. Camille’s weekly tips are useful and Olivier’s personal, technical support is reassuring. All in all an excellent resource. My only problem is France is so far away! Good practice especially listening. I am a long term beginner. This audio series allows you to gain a much greater sense of the normal speed and dialog used in a typical setting. It is an excellent course, that will help you tune up your listening, comprehension skills. I highly recommend this series. It is relatively easy to use and about the best I have run into for studying French. I divide the lessons into sections and study a little each day. They work well with the French Today newsletter which I study daily. The French language has come alive for me. It is very well done. I listen to the story 4 times, read the story 4 times, do the study section for 3 or more days depending on the exercises. In Moi 1 and 2 I used the questions and answers also for dictation. I find it difficult to do now as that section is missing. I am a French student and I am enjoying my purchase of the Á Moi Paris series. 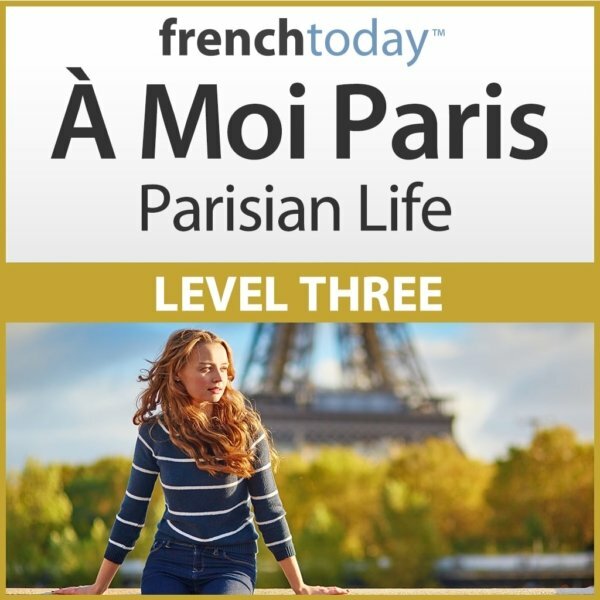 I am on level 3 now, end it has been extremely helpful in learning every day French conversation, and also the grammar portions are very useful and easy to understand. I would highly recommend this series. “Merci” French Today ! I am learning pronunciation, vocabulary and grammar with a better understanding than ever before. The great tips shared are extremely helpful. French Today has shed new light on my learning-French experience. 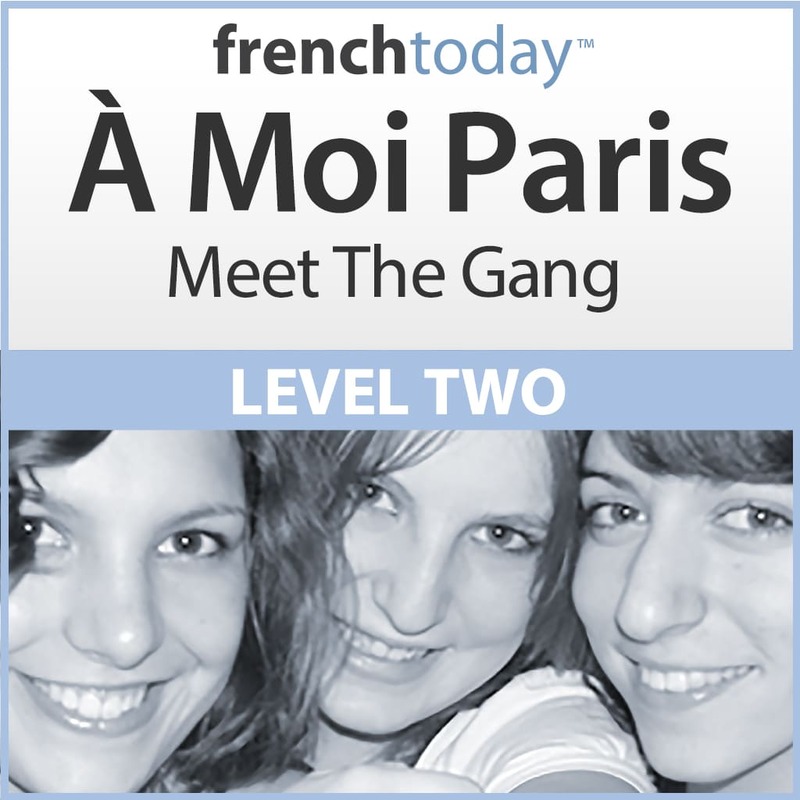 I’m happy to have discovered FrenchToday and would recommend it to friends as it is presented with humor, with great logic and densely packed with information, including some wonderful tips regarding how to learn to speak and pronounce French. I’m not giving it a 5 Star because I wish there was more dialogue included with Level 3, but there is certainly more available by purchasing other audio books. The frequent emails and (free) stories that arrive are also quite useful and handy: they present bite-sized bits of information that are less overwhelming than full explanations of specific subjects (and of course are there to – quite understandably – coax you into buying other products). But all are done in a charming way. I jumped in at Level 3 so I don’t know (yet) what other levels have to offer. Thank you for your review Marc. FYI: The odd levels (1, 3, 5) are more the core grammar method and the dialogs are there to support the grammar points, the even levels (2, 4, 6) contain much longer dialogs and are meant to be more the practice/perfecting audiobooks. Merci, excellent learning tool. The grammar is explained very well and the exercises helpful. These materials are excellent. I need to use French every day, and the vocabulary and expressions in these audiobooks help me in so many situations. Camille’s explanations are clear and practical. She has a real feel for what you need to know to communicate successfully in French, and has lots of useful tips. Much better than the more traditional methods ! 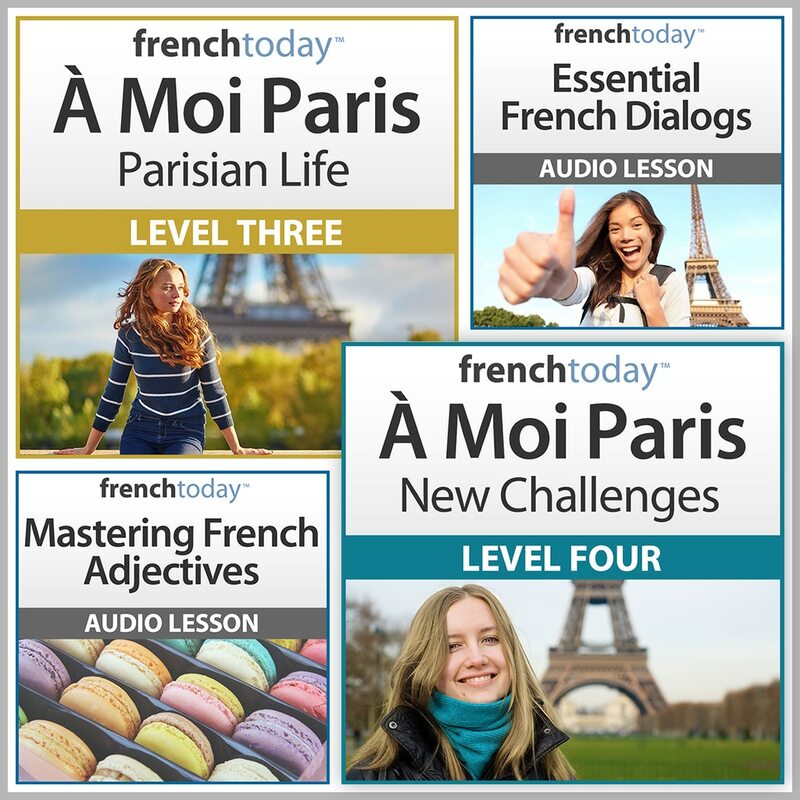 This series is terrific for training my ear to understand spoken French. The inclusion of French idiomatic expressions is something I have not found elsewhere in my studies; this is incredibly helpful. And the Study Guides are the best I’ve come across for detailed explanations of French grammar and pronunciation. I’ve often heard it’s best to learn a language the way children do, without concentrating on grammar. But as an adult, I still have the curiosity to understand the logic (or illogic) of the grammar. This course is excellent in explaining things that I’ve wondered about through the years (on and off) of studying French. I have found every audiobook in the series to be extremely well done and useful. I especially like that you can listen on “slow speed.” I can listen sentence by sentence and use it as dictation or as a means of repeating the sentence outloud. I would definitely recommend this audiobook series. I’m very happy with my recent purchase of audiobook level 3 & 4. I’ve taken French lessons on and off for many years before and have studied with apps too but always felt that my speaking and listening weren’t improving much. The frenchtoday series are actually making a difference only after 4 lessons. I feel that my understanding is getting better. It is fun to study with the app and you also receive great language tips via e-mail that is very helpful. I can tell the creators of the app/material have a great understanding of where the difficulties of a foreign speaker lies and they have structured the app with that focus in mind. I totally recommend the frenchtoday À Moi Paris audiobooks. This really is the very best method of learning French that I’ve come across. I had a French teacher, who kept on telling me to watch French TV or French films, but it all seemed much too fast and I became disheartened. The French Today method is a really excellent, graduated approach that allows you to build your language knowledge with confidence. And I really appreciate the weekly emails also. I have been aspiring to learn French for some time over the years, starting in high school. Recently, in preparation for moving to the U.K. and having much easier access to France, I have been trying anew to gain some level of fluency in French. I had been using Duolingo, which is helpful enough for learning some vocabulary and verb conjugations. However, it does not have anywhere near the context, useful conversation, language tips, and instruction in use and pronunciation of modern French as Camille and Olivier’s audiobooks. Initially I had stumbled on French Today as I looked for more insight into how to actually speak French to real people. They have incredibly helpful and informative blog posts that are an amazing resource. If you want a taste of the audiobooks, do check out the blog posts. Camille’s tone is friendly and accessible, and she explains the complexities of French quite clearly, along with invaluable tips on how to bolster learning. Recently I decided to purchase the audiobook series after following the blog for a while. I accidentally purchased the beginner levels 1 and 2, thinking I am definitely a beginner but realizing I would have been better off with levels 3 and 4. Olivier was incredibly accommodating of my mistake and graciously arranged for an exchange of materials in a very timely manner. The materials are clear, friendly, and genuinely helpful. The most valuable part of the materials to me is the street pronunciation of French, which is quite different from what one is generally taught in American school or in other self-learning courses. Thank you so much to Camille and Olivier for their accessible and fantastic products! Thank you for your help today, I can now continue with my studies. With the three levels of learning it is easier to progress. Your help today says your back up service is as good as the product. Great listening practice. Highly recommended. Realistic and useful conversation. Very crisp and clear audio recording ! Great for absorbing the adverbs, adjectives and phrases! I’m really enjoying the course material. It makes a nice change from the conventional learning processes. To be able to understand the nuances of street french will be of great benefit . I will certainly purchase the next chapter once I have completed this one. A well structured and very clear explanation of basic French grammar, concentrating on the present tense and the little words that give learners a lot of difficulty in any languate. The integration between a really interesting story and the lessons is a real strength, as is the choice of speeds with which the story is read. The emphasis on ‘street French pronunciation’ is great. This whole series of audiobooks is a fantastic resource for early intermediate students trying to progress to the next stage. Many mysteries of the French language are clarified in a way that is difficult to find elsewhere. I was a French major in college and proceeded into an entirely different direction for employment and pleasure. I am refreshing my French after almost 50 years and find the approach being used in the audiobooks and email communications to be highly practical and beneficial. Thanks for doing such a thoughtful and friendly effort toward teaching French as it is spoken today. Excellent explanations of the French grammar rules and I like the translation exercises which help to consolidate what I am learning. I had to guess at which level I should begin, but I must have guessed right. I always understand what Marie and her friends are talking about, and after listening several times I understand nearly every word they say. Camille is a very expressive reader, so the recordings are interesting to hear even when you’ve heard them a few times already. It’s an encouraging way to learn to French. I came across this site when I was searching for a French grammar book. I noticed they have books for verbs, but they have no grammar book. I emailed Olivier that I perfectly understand French, but my grammar needs some improvement and I don’t see any grammar book. What he said made me decide to buy all their books. He replied: Since you fully understand French, it is cheaper for you to get a grammar book from Amazon. Somehow, I liked his honesty, instead of going to Amazon, I bought all their books. This was my best investment. I need to say, listening to A Moi Paris 1,2,3,4 my grammar improved a lot. Thank you for the new link to the audio I had lost . I also thank you for the weekly lessons. I have been trying to learn French for 10 years now ,and after trying your system I wish I had found it before . I have made more progress this year with the words and audio together. It took me a while to work out, how to load it on my ipad, but i am very happy with the audio book, and will buy more in the future. Merci beaucoup. Camille has a way of explaining some of the ‘sticking points’ for students in ways that are easily understood and memorised, rather than drowning them in confusing ‘grammar speak’. Of course, some knowledge of grammar in your native language is a bonus but students need to keep their eyes on the prize and not be forced to study in detail what is, after all, another subject. I have bought several courses in recent years and gleaned what I could from them but with this course I see a light at the end of the tunnel in achieving my ultimate goal- speaking and understanding street French in Paris without sounding ‘comme une vache espagnol’. I am very pleased with the audio learning,especially the street french. The sytem you use makes learning la french a lot simpler. I have bought the other books in the series and really do enjoy seeing how Mary has matured over time. I decided to buy level 3, because I wanted to know what happened to Mary in between levels 2 and 4. This 3rd book is brilliant. 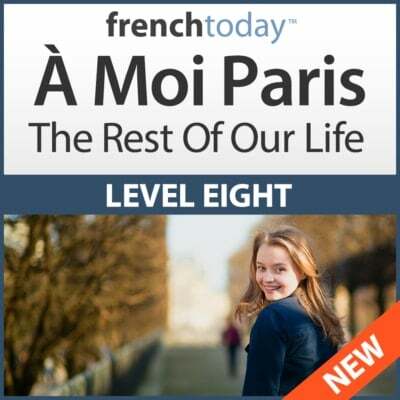 It has helped me express myself better in situations that I never thought about and the audio is, as usual, extremely clear and excellent for fine tuning one’s French. Sometimes I ask myself where I would be without the “A Moi Paris” series. I think of it as the ideal soap opera for a French learner. I always wonder what will happen next in the story and my with the helpful exercises and grammar explanations after each chapter, my French continues to improve more and more. Camille and Olivier never cease to amaze me with each installment in this “très chic” series. Each new installment has excellent audio, clear explanations, useful exercises and helpful insight on grammar and French culture. There will be levels 5, 6 and beyond, right? Well, at least I hope there will be. Thank you Camille and Olivier for making my French studies enjoyable and suitable for everyday life. Since I am very hard of hearing, the crystal clear pronunciation at slow speed is immensely helpful to me. I’ve worked with MANY French language podcasts and programs and French Today is by FAR the best! I love that they teach French the way it is actually spoken by natives! It makes SUCH a big difference and really helps you grasp the language. Big thanks to them for all of the work they put into this product! I’m so thankful that it exists! I did not know what to expect when I took a chance and purchased the level 3 and 4 series. I am at the present moment about halfway through level 3. I deeply appreciate the clarity of the speaker’s enunciation of the spoken French. I have found listening to the slower version multiple times after reading the dialogue for that section carefully a number of times followed by repeated listenings of the faster version most productive for me. I do appreciate the flow of the street version. I have always had difficulty with the flow of spoken French and these dialogs have been excellent. I also appreciate many elements of the Study Guide. I am enjoying the series and regard the money spent well worth it. I don’t expect to ever be fluent in French; but I do hope that my visits to France in the future will leave me batter able to handle what is thrown at me. I am already OK with written French at, say, the early lycée level; but improving somewhat with my conversational competence, which is pretty close to zero presently, is my goal. So far, so good. I like these learning materials and am pleased I purchased them. Merci pour le matériel pédagogique excellent. Je vous écris cet email pour exprimer un grand merci pour votre creations of the audiobooks. They really helped me ALOT in progressing eassier in the learning process, they are brilliant, user friendly, and contain interesting topics which is rare to find in language books and the most important part they explain how modern french is like !! Believe me the audiobooks make your life easier because instead of saying je ne sais pas you just say “chepa” and many more complex words are maid easier.. Million thanks to French today !! These audio books are very helpful. They can be used in so many ways; from deliberate study using the study guides found after each chapter, to listening through your car’s stereo system as you drive to work. There are many layers of learning in each book. Well done, Camille! Love it. The audiobook has already helped my comprehension a lot (love the slow version to start!) and I also love the related grammar lessons! Bravo! Excellent stuff! Difficult enough to make me really listen, but easy enough for me to feel good about my progress. Thank you! I love the story and the recording, I learn a lot from to the study guide and I love listening to eat on my way to/from work. It’s the perfect solution for people like me that loves French but don’t have the time to take private lesson during the day. I will definitely buy additional lessons and recommend to everyone. One of the best materials available for those undertaking independent study of French. The dialogues present common situations in an engaging manner. Very intelligently done. 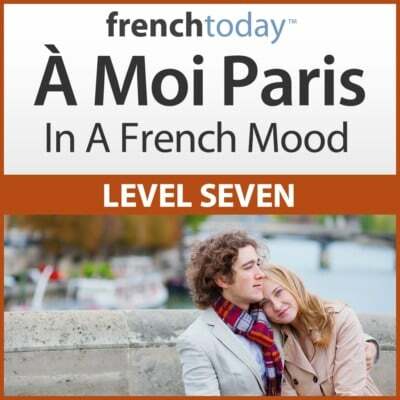 I am enjoying listening to the A Moi Paris audio series (level 3 + 4). I especially like the the two modes of audio, ie slow speed and street conversation speed. The accompanying Study Guides are helpful as they introduce the language and a good explanation of any related grammar being used for each of the chapters. The Study Guides contain exercises that also help to cement what is being taught. Overall, a very useful resource to improve your French. I found this series very helpful in converting my high school French into something that could actually be used to speak to and understand French people. Camille is a great storyteller, and speaks very clearly. She uses current French pronunciations and also some slang-type words. Again, a great help in understanding what’s going on around you. I learned a huge amount of vocabulary “in context” which is easier than learning from a list. Good variations of situations – shopping, travelling, computers, cooking, restaurant, relationships, medical. The language is challenging but is set at the perfect level. I think the study guide could be more helpful. A good way to improve your ability to both understand and make full sentences. Easy to understand, and fun to do, because it’s natural dialogues. I have found this audiobook very helpful. I like that the dialogue is recorded at 2 different speeds. I try to copy the dialogue at the slower speed using the pause button and then listen to the recording at street speed. It really works, my spoken french is so much better. The written book with translation is there for when I don’t understand and the exercises at the end of each chapter help to reinforce the grammar points, I find it easier to see an example for it to sink in. But for me, it is the audio that has helped the most, I know I have made some progress with this method and am more confident in my spoken french. My friend and I have been taking lessons in French (we live in the Aveyron) but it has been very difficult to find a qualified teacher. We both felt that we were not progressing, so I suggested we have a go at the “A Moi Paris”, we love it. It is giving us a range of verbs, grammar, but most of all it is teaching us to ‘speak’. ‘Listening’, ‘understanding’, and ‘pronouncing’ are all in the audio which also describes the correct way to glide the words together. We get together at the moment once a week and 2 hours just fly by. Each chapter is the right length to work at and to feel achievement has been made. Well done and thank you. For me, AMP is an ideal method for learning the French language. One easily gets caught up in the story and before you know it, you’ve learned many new words of vocabulary and some French grammar. Each chapter exposes you to a different grammatical concept and at the end of the chapter is a clear and concise explanation of the grammar along with some exercises to reinforce your understanding. As usual with Camille’s recordings, the audio is superb and the different speeds really help with understanding French natives.